Tremoctopus is a genus of pelagic cephalopods, containing four species that occupy surface to mid-waters in subtropical and tropical oceans. They are commonly known as blanket octopuses, in reference to the long, transparent webs that connect the dorsal and dorsolateral arms of the adult females. The other arms are much shorter and lack webbing. Tremoctopus violaceus exhibits the most extreme degree of sexual size-dimorphism known in any non-microscopic animal. Females may reach 2 m (6.6 ft) in length, whereas the males are 2.4 cm. The weight ratio is at least 10,000:1, and can probably reach as much as 40,000:1. The males have a large arm in a spherical pouch modified for mating, known as a hectocotylus. During mating, this arm is detached, and kept by the female in her mantle cavity until used for fertilisation. The male almost certainly dies shortly after mating. The females carry more than 100,000 eggs attached to a sausage-shaped calcareous secretion held at the base of the dorsal arms and carried by the female until hatching. Blanket octopuses are immune to the venomous Portuguese man o' war, whose tentacles the male and immature females rip off and use for offensive and defensive purposes. Like many other octopuses, the blanket octopus uses ink to intimidate potential predators. Also, when threatened, the female unfurls her large net-like membranes that spread out and billow in the water, greatly increasing her apparent size. ^ a b c Philippe Bouchet (2013). "Tremoctopus delle Chiaje, 1830". World Register of Marine Species. Flanders Marine Institute. Retrieved 6 February 2018. ^ Norman, M.D. ; Paul, D.; Finn, J.; and Tregenza, T. (2002). 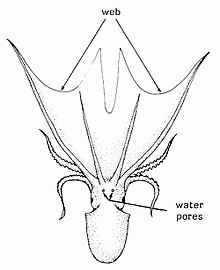 First encounter with a live male blanket octopus: the world's most sexually size-dimorphic large animal Archived January 19, 2005, at the Wayback Machine. New Zealand Journal of Marine and Freshwater Research 36: 733–736. ^ Pickrell, John (Aug. 12, 2003). "Walnut-Size" Male Octopus Seen Alive for First Time. National Geographic News. ^ M. D. Norman; D. Paul; J. Finn & T. Tregenza (2002). "First encounter with a live male blanket octopus: The world's most sexually size‐dimorphic large animal". New Zealand Journal of Marine and Freshwater Research Volume 36, Issue 4. 36 (4): 733–736. doi:10.1080/00288330.2002.9517126. ^ Jones, E. C. (1963). "Tremoctopus violaceus uses Physalia tentacles as weapons". Science. 139 (3556): 764–766. Bibcode:1963Sci...139..764J. doi:10.1126/science.139.3556.764. PMID 17829125. ^ Thomas, R.F. (1977). "Systematics, distribution, and biology of cephalopods of the genus Tremoctopus (Octopoda: Tremoctopodidae)". Bulletin of Marine Science. 27 (3): 353–392. This page was last edited on 16 April 2019, at 18:14 (UTC).